Delicious and freshly, “cooked to order” noodle and rice dishes from an extensive menu, served in a sleek, minimalist, non-smoking environment. 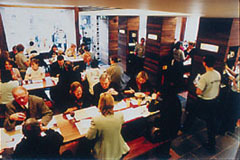 Long bench-style tables and friendly waiting staff create the lively and informal atmosphere of this popular restaurant. Take-away available. Open Mon-Sat noon-11pm, Sun 12.30-10pm. All major credit cards accepted. No service charge. Rice and Seafood is the fundamental food of Japanese cuisine. Sushi a common favorite not only because it tastes good but because its healthy and light. Sushi can be prepared in many different forms such as Maki sushi, Nigiri sushi Temaki and Sashimi. Maki sushi contains strips of fish or vegetables rolled in rice and wrapped in crisp, thin sheets of dried seaweed. There are many combinations that even the most timid can enjoy- smoked salmon, fresh crab, or shrimp. The adventurous can sample delicacies like octopus, raw clams, sea urchin, or salted fish roe.